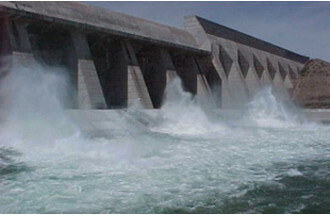 The Pueblo Dam will soon be producing enough renewable energy to power 3,000 homes. The Southeastern Colorado Water Conservancy District plans to begin construction of the $19.5 million hydroelectric generating station later this year. The construction site will be located downstream form the Pueblo Dam River Outlet which was constructed to serve as the connection for the Colorado Springs Utilities Southern Delivery System. “We’ll be using the water that’s flowing into the river again, we won’t be consuming any of that water,” explained Conservancy District spokesman Chris Woodka. The District borrowed $17 million from the Colorado Water Conservation Board to build the plant. It will house a trio of turbines, each capable of producing electricity whether the river is moving fast or slow. “We designed it so that it would at several different flows so that we could get the maximum production out of it,” Woodka said. The Conservancy District expects to generate around $1.4 million annually from the sale of it’s electricity. Groundbreaking is expected to take place in May and Woodka said their goal is to have the power plant go online in the Spring of 2018.